This Memorial Day, we’ll be honoring the noble sacrifice of one of history’s finest Maverick Hunters with this story digest of X and Zero’s early exploits. 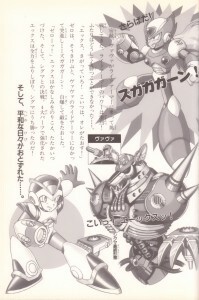 From the Rockman & Rockman X Big Encyclopedia of Secrets, we now present to you: The Rockman X [CONFIDENTIAL] Chronicles. In the year 21XX A.D. Sigma, the strongest repliroid in history, has incited a large-scale rebellion against the human race. For the sake of the humans, and for justice, X and Zero set off to battle against Sigma and the 9 bosses. After a violent struggle, the duo of X and Zero had at last defeated 8 of the dreaded bosses. The final battle was steadily approaching! The two break into Sigma’s fortress, where standing in their way they find…..
Sigma: Ho ho ho ho ho, you two will never be able to defeat me, the almighty Sigma! Zero: This is goodbye! ZZZ-KA-KA-KABOOOM! Sigma: Come and get me! E~X! “X, stay back! 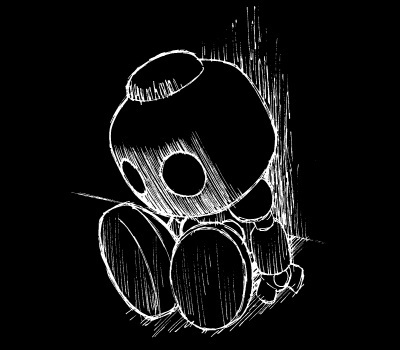 This guy is mine to defeat!” And with that, Zero lunged directly at VAVA’s ride armor….. ZZZ-KA-KA-KABOOOM! By self destructing in a kamikaze attack, he had felled the enemy. “ZEROOOO!” Overcoming his grief, X carried on the fight. And at last, it came time for the final battle with Sigma. 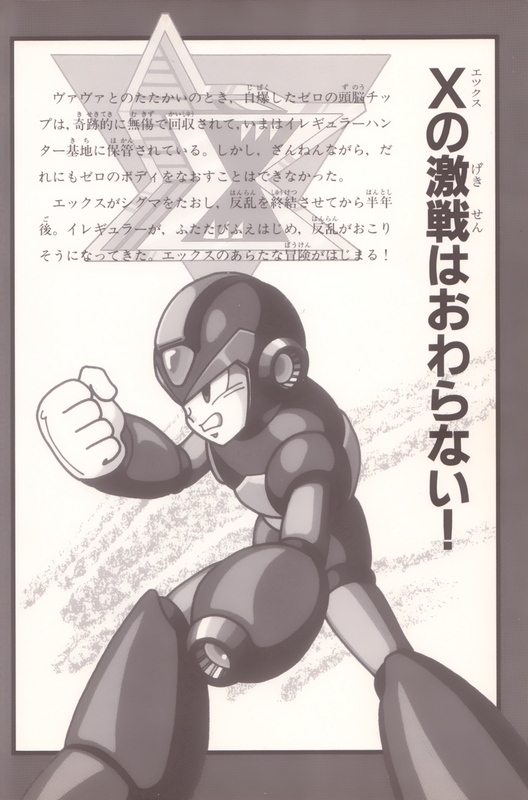 With his strength intensified by the 4 super-parts, X pushed all of his power to the limit to finally vanquish Sigma! X’s Fight Isn’t Over Yet! After Zero self-destructed during the fight with VAVA, his control chip was miraculously unharmed. It was recovered, and is currently stored at the Irregular Hunter base. Unfortunately, however, no one there was able to repair Zero’s body. 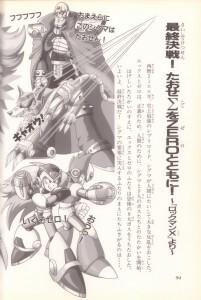 It has been half a year since X defeat Sigma, ending the rebellion. Irregulars are once again on the rise, and yet another uprising is fast approaching. For X, a new adventure is just beginning! The above summary from Kodansha’s Manga Encyclopedia #24 was written to serve as a prologue to Rockman X2, the latest X game at the time of the book’s release. 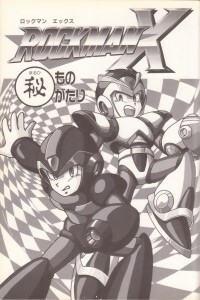 The story has been simplified to keep only some of the most exciting and pivotal points as they relate to X2. It was made with a younger group of readers in mind, but it should be enjoyable to X fans of any age. Tomorrow, the saga continues with Zero’s revival! 2 Comments to "Rockman X Confidential"
You must have been confused and disappointed then! Hopefully, this was just as good?